The Mu Cang Chai terraced rice fields in the northern province of Yen Bai, Vietnam, have been praised as one of the world’s top 20 colourful places by the New York-based magazine Conde Nast Traveler. 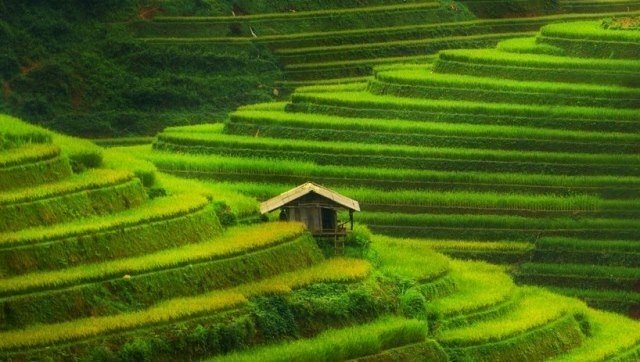 Around 280 kilometres northwest of Hanoi, these rice paddies in Vietnam’s isolated northern reaches have gained Instagram fame for their impressive angles in a topographically challenging region, the magazine reported. Each year, the colours change from green in late spring and summer to yellow in October as the rice ripens. The magazine also suggested that travellers visit the fields in the beginning of October, when the rice harvest begins, and stop by twice: once early in the morning before the crowds arrive, and a second time at sunset. Other Asian places named in the list include Arashiyama Bamboo Forest and Fushimi Inari Taisha (Japan), Chengdu (China), Jaipur (India), and Chiang Mai (Thailand). As a luxury and lifestyle travel magazine published by Condé Nast, Conde Nast Traveler magazine has won 25 National Magazine Awards. Its annual award is known as the “pinnacle of the world tourism industry”.